The parsnip-flower buckwheat is a long-lived plant with woody stems that branch at the base and small, narrow, densely hairy or woolly basal leaves. It grows in clumps about two feet broad and sixteen inches high. Small white or yellow flowers form dense single or multiple umbrella-like clusters at the end of the upright, nearly leafless stems. Each flowering stem produces one or more ball-like clusters of flowers, usually whitish-yellow becoming pinkish with age. 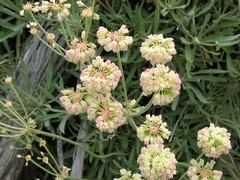 As a group, desert buckwheats may be one of the most important plants of the shrub-steppe, collectively providing the single most important nectar source for bees in this ecosystem. Also, their seeds provide a major food source for birds and rodents. Native Americans boiled different parts of the buckwheat in water to drink as a cure for colds, tuberculosis, and syphilis, to apply on sores, and to use as a wash in the sweathouse.